I’ve hiked past them for years – rustic cabins perched high in mountain creek valleys. I’ve always wondered, as I’ve passed, what they were like. Doyles River, Pocosin, Range View, Corbin… each sits within the boundaries of Shenandoah National Park, occupying the historic site of an older homestead, in many cases – but they’re private, accessible only to members of the Potomac Appalachian Trail Club (PATC). Growing up just outside the park, I had plenty places to ramble and camp without “cheating” and staying in a cabin, and so the details of these little homesteads remained a mystery. Until last month. Tulip Tree Cabin, built with hand tools. We were planning a winter excursion with the Boy Scouts, and wanted to make the trip accessible to those without good cold weather gear, or those who lacked the desire or wherewithal to go spend money on new camping equipment. These cabins turned out to be the perfect solution, and we found two, essentially side-by-side, just outside the park, that would serve us well. 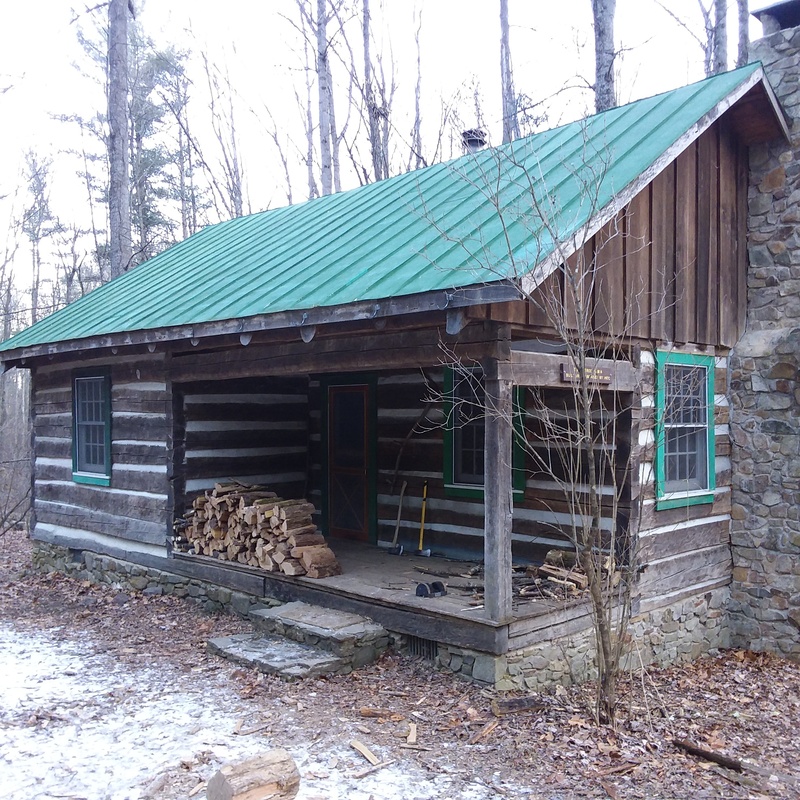 Tulip Tree Cabin is a rustic (no power, no water) cabin that sleeps 8. Nearby Lambert is better described as an older house – with power and water, it was inhabited full-time by one of the first employees of Shenandoah National Park, Darwin Lambert, until 2005. As part of the agreement that granted ownership of the house to PATC, permission was given to build a new cabin on the adjacent 5-acre plot – but ONLY if it were built from local materials completely without power tools. Thus, Tulip Tree is a hand-built cabin, decorated with the cross-cut saws and other tools used to erect it. I elected to stay in the more rustic of the two, Tulip Tree. Arriving after dark, with a light snow on the ground, we navigated the tricky (for anything other than high-clearance vehicles) Morning Glory Rd up to a small parking area, and then hiked a tenth of a mile or so to the darkened house. Candles on the mantle and dining room table gave us enough light to get the fireplace lit, its stone hearth reflecting enough light to see. The wood stove soon followed, and soon it was rather toasty inside. The cabin has a vaulted ceiling over the dining/living room and kitchen. The rest of the house is occupied by two bunk beds on the lower level, and a loft above containing two queen-sized beds. Cooking gear is available – but the only cooking surface is the top of the wood stove. At least, this is true in the winter – during summer, a stone barbecue and fire pit outside, complete with covered picnic tables, offer an outdoor alternative. The privy facilities are also outside, a ways into the woods. Interior of Tulip Tree. Bunks in back room and beds in the loft. All cooking is on the wood stove – the “kitchen” to the right is just a dry prep area. Firewood was stacked on the porch, but each guest is expected to leave wood for the next, so splitting wood was a regular chore while in residence. An ax and splitting mall were in the building. The view west from the ridge top. Meanwhile, those up the road at Lambert had the luxury of running water, a full bathroom, and electric appliances in the kitchen. Upstairs, two small bedrooms and a large bunkroom could accommodate up to 10 total. “Pluto’s Ghost” – a column in Luray Caverns. Using the cabins as basecamp, we explored Shenandoah. Crusher Ridge Trail leads just over 3 miles, and 1700 vertical feet, to the Appalachian Trail and Skyline Drive just south of Stony Man Overlook. Another mile and half would take you to the cliffs atop Stony Man, over 4,000 feet. Outside the park, a short drive gets you to Luray, and the famed Luray Caverns and associated museums. As camping goes, this was a lot easier than living completely out of a backpack. But particularly in Tulip Tree, it didn’t feel like cheating. Feeding a fire all night for warmth, cooking on a steel slab in cast iron pans… we were transported back 100 years or so. And I loved it! For more information on the Potomac Appalachian Trail Club (PATC) and its cabins, check out www.patc.net.